The Game Crafter often throws down a challenge for designers to develop a game based around certain principles, themes or mechanics. 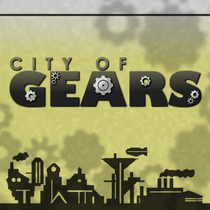 Last year, City of Gears won the "Steampunk Challenge" for best Steampunk themed game so when I had the opportunity to get a copy for review, I was very curious, being a lover of cogs, gears, clockwork anything, and of course, steam powered contraptions. Inside the box, I found automotons, city buildings, bomb filled dice, and factories that all led down the pathway to building the City of Gears. The story goes that Sir Esmund Funglass was creating the City of Gears to be a shining example of Man and Machine working together, however, something happened (as it usually does with the best laid plans) and the city was never finished. You and the other players take on the role of venture capitalists entering the city with your limited supplies of automotons, steam, and gears, in the hopes of finishing the city! City of gears provides 16 different "city tiles" that are shuffled at the beginning of the game. 9 of these are used when creating the city, laid out in a 3 x 3 grid. This alone means most every game will be different as you can not only randomize the 9 tiles used, but their positions in the grid that make up the city. To begin, each player takes a factory, 7 meeples that represent automotons, a handful of colored discs, and a joystick to keep track of their Victory Points (which is how you win at the end, having the highest). The Factories are placed adjacent to the 3 x 3 grid of city tiles (which are all face down at the beginning of the game) and each player takes turns taking one "Gear POG" out of a bag and choosing to make their first connection to the city, or use it as an upgrade. Each player's turn consists of Rolling the Production dice (starting on the second round and every round thereafter), taking actions and moving workers, and checking for endgame conditions. 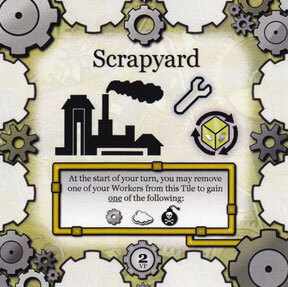 If the players choose to use their first POG as a link, they place it on their factory and the space they are connecting to, with the POG "straddling" or "connecting" the two pieces. They also take one of their colored discs and place it on top of the Gear, representing they "own" that link. This is important for end game scoring, but more on that in a bit. After everyone has chosen to either use their first Gear POG as an upgrade or as a Gear to link to their first piece of the city, the real run begins. Post the first round, players roll production dice which can provide steam, gears, bombs, or blank results. Players then use these resources, combined with their factory abilities, to explore further into the City of Gears. Each City Tile offers abilities as well, which can be use for the cost of Steam usually, or may offer a "At the start of your turn" ability. To use these though, you must have an automoton present on the city tile. 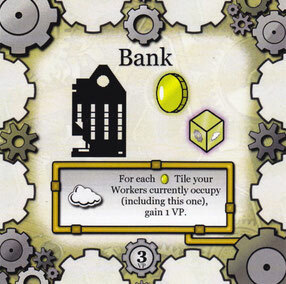 Additionally, some, like the Bank pictured above, offer additional dice to be rolled if you had an atuomoton on them at the start fo your turn, further increasing the resources you have access to. Others can provide movement points, victory points, special movement bonuses (like teleporting), and of course, there are combinations in the game, that will benefit you to have more automotons on the board on multiple tiles... but beware... there be bombs here! Bombs are a big part of the game. When you roll a bomb, you can potentially wreak havoc on your opponent's well laid plans. One bomb lets you destroy an opposing automoton on a tile where you have an automoton, and rolling 2 bombs means you can destroy an existing Gear link that is on a tile where you have an automoton present. Why would you do this? At the end of the game, players own the tiles they have the most of their colored Gear links on, so the aptly timed explosion can switch ownership of a tile, and end game victory points, in your favor! Play continues until one of two things trigger the end game. Either all the Gear POGs are gone from the bag or one player has linked together every tile in the city with their color links. The latter can be an extremely well timed, and shrewd plan, if operationalized correctly. Once end game is triggered it's time to count the victory points up. During gameplay, when you first flip a tile and explore it, the player who linked to it, flipping it, gains 1 VP automatically. At the end, those colored links we've been talking about are important, as the person with the most colored links on a tile is considered to own it, and gains the VPs marked on it. In the event of a tie, the number of automotons on a tile breaks it. This is why bombs can be so important, especially late game. The person with the most VPs is declared the winner and everyone has a clockwork cocktail and smiles... and usually wants to play right again! City of Gears is just that type of game! There are a lot of strategic options that come up throughout the game, and more than enough to keep you engaged on other player's turns, so oyu can plot out your best course to move your automotons and gain as many victory points as possible. 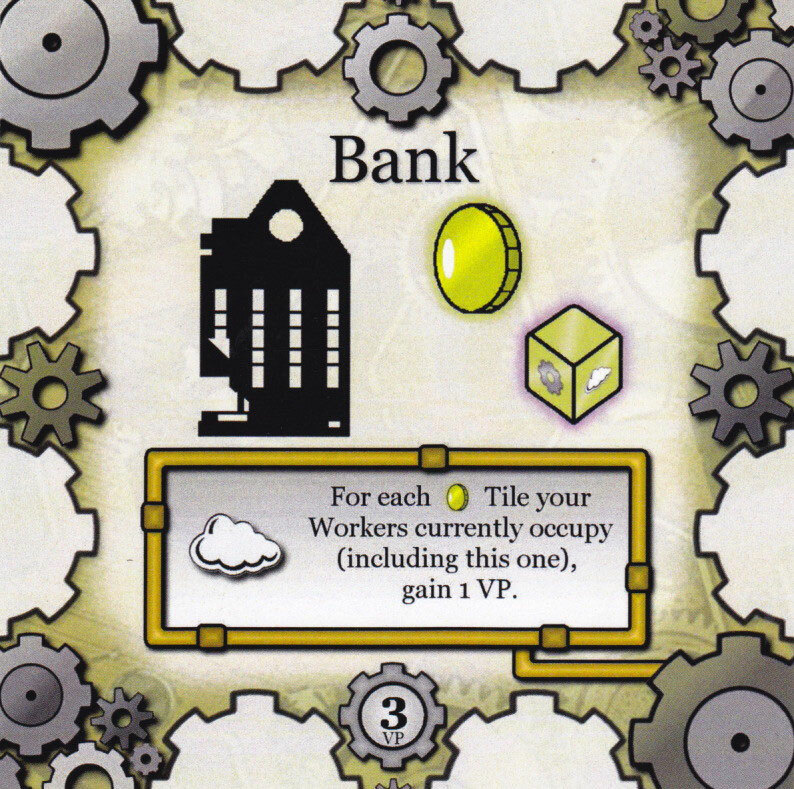 The rules also allow for very flexible gameplay, in that you can move your workers and take your actions in any combination you want, allowing for some creative and powerful combinations throughout the game. Will you try to max out your dice and gain a lot of resources? Will you move your automotons onto key areas to both secure their abilities and prepare for combat, will you take a balanced approach and attempt to be efficient, or will go all out and embark into the city with as many automotons for combat as possible? The options and the high replay value really make City of Gears shine as an excellent, yet simply designed game. City of Gears is a game that does not disappoint, in any fashion. It's creative use of resources to manage and high amount of variability keep you coming back for more! For those wanting more, there is also an expansion as well! However, the base game offers a lot of great fun right out of the box, and is a game that can scale well between 2 and 4 players to be enjoyable by all. Our youngest players loved it and our oldest players dug in deep and enjoyed it as well, making City of Gears a Crit of a game! City of Gears: Crit, Hit or Miss? Tox, I frequent Boardgamegeek a lot and I somehow had still never heard of this game. Thank you so much for doing a video for it as it definitely looks like something I should add to my collection! I'm sorry if you mentioned it in the video, but would you say it worked equally well with 2, 3, and 4 players? Glad you liked it Tim! It does play equally well! We've enjoyed 3 player the most, but it's fun in any combination. I check out BGG a lot as well but the best http://www.theGameCrafter.com games I find are perusing their site and interacting with their community directly. They are smaller size games, but big on value in my opinion. Thanks for watching/reading and commenting! My husband Mark makes games through The Game Crafter site, so we picked this up after the Steampunk Challenge. We've pulled this game out a couple times in our game circles and always enjoy it. There are some types of games where you come up with one strategy and never try to do anything else, and one thing I like about City of Gears is that kind of thinking will really set you back. Being versatile and letting the chips fall where they may (sometimes literally) is really important. Lots of fun! That's awesome to hear Christina! I'm working on the expansion for it now too and we've loved this game. It's a blast! Glad to hear you are enjoying it! Thanks for watching and commenting!